Bernie Sanders has officially started his campaign to take over the world. My Facebook friends list may be what you consider homogeneous – it consists mostly of my college friends, who all go to a small liberal arts school just outside of Philadelphia. The majority of us are pretty liberal, we are pretty involved, and we consistently have opinions about everything. The recent midterm elections left my friends and another large portion of this country in utter disgust. We watched with horror as certifiable “nut jobs” as my grandfather would call them, took leadership positions on committees they had no business leading (Read: Jim Inhofe to Lead the Environment and Public Works Committee). And – there’s no good way to sugar coat things – we were enraged. It was our own fault. We were in a rut – we felt that even though major changes should have occurred, things still felt kind of like they did when Bush Jr. was in office. We lost the will to fight, and we handed the midterms to the Republican Party on a golden platter fit for Wall Street. I remember my friends taking to social media to vent their frustrations. Hank Green used his YouTube channel to beg young people to vote. The entire Internet – at least, the parts of it that are dominated by younger adults or the left-leaning – exploded. This huge social media storm is the momentum that Bernie Sanders channeled as he took to the stage with promises of absolute truth and anti-capitalism. And boy, did the millennials hear him. We sang his praises as Sanders championed the rejection of Super PACs. We fell to his feet as he advocated for raising minimum wage, and had a voting record to match. And just as quickly as the media laughed away his candidacy, delegitimizing his campaign as “too fringe”, the young voters revolted in an unprecedented rise of political activism in a sphere that the generations before ours claimed was apathy. Bernie Sanders, for all of his weird quirks, has captured the hearts of millennial voters – but why? So many are rightfully baffled by his success, especially considering Clinton is the frontrunner. Support for her was predicted to be unwavering. Yet Sanders has managed to gain on her significantly in a lot of key states. Bernie Sanders is unapologetically real. People are sick of politicians who can’t put their vote where their mouth is. We don’t want another puppet whose strings are pulled by those with the most money in their wallet. We don’t believe that either party has a particularly good track record right now. We don’t trust Clinton to say no to Wall Street when it matters most. Bernie Sanders took a huge step in creating trust by refusing Super PACs. This sent a loud, clear message to both Wall Street and the American voters: Bernie Sanders can’t be bought. 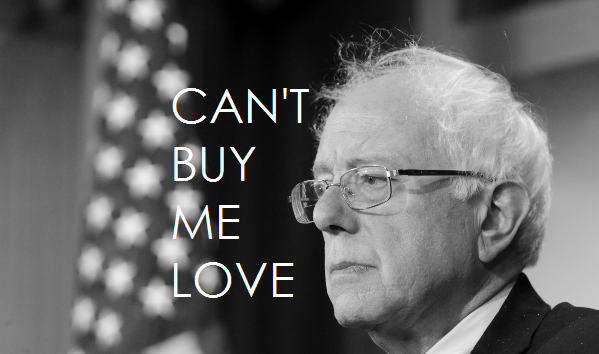 Bernie Sanders has an amazing marketing strategy. Bernie doesn’t back down from a fight. I’ve always thought that watching debates is useless. It’s generally a bunch of politicians making grand claims that will never be fulfilled, and dodging the important questions that are thrown their way with misdirection, under-researched generalizations, and outright lies. Not only does Bernie show up prepared to fight, but he doesn’t back down when things get tough. He manages to be respectful to his opponents while also demanding that his voice is heard. To me, that sounds like someone who would make an effective president. Sanders is succeeding with young voters because he represents the things we want to believe about our system. He represents a belief that our vote matters. He represents a belief that we still have control in a government that has fallen under the power of The Megacorporation. He represents an America that is by the people, for the people. This is a cause that millennials will get behind. We have the audacity to believe that Bernie Sanders can win this election, and we’re willing to work to prove it.